You can find inspiration in the damnedest places. Years back the wife and I spent the summer going to different types of racing -- from Human Powered Vehicle (HPV) racing to the Soap Box Derby. At every event I saw something that could be applied to auto racing. For example at the Soap Box Derby it was all about frictional/aerodynamic drag and how they drove the course. Even though the lanes are straight, they weren't perfectly flat and the racers figured out how to take advantage. Do auto racers look at these things? Yes, but at nowhere near the focus of Soap Box racers. Sometimes inspiration can even be found outside of racing. 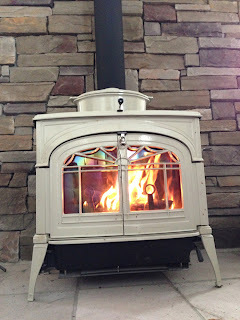 Last fall we installed a wood stove in our house. Given I was a wood stove newbie, you'd guess that I looked at the stove directions or asked for advice. Nope, I just jumped right in, figuring it was a simple task -- Just throw in some newspaper, kindling, firewood and light a match. At first I thought I only needed to worry about the amount of fuel (wood) and inlet air. Well, I quickly learned the key to a great fire is building heat in the firebox -- getting the cast iron hot. At this point combustion becomes very easy and efficient. Too much inlet air during warmup has a real cooling effect. Yes, of course air and fuel are important, but everything becomes easier when the "combustion chamber" is hot. Good Warmup - A thermostat and the ability to add load to the engine will quicken this process. Block Filler (Grout) - Only applicable for short term racing like drag racing. Most people think this helps performance because it stabilizes the cylinder walls, Nope, it's because it creates the condition where you can have a hotter lower engine and cooler upper engine at the same time. Less Combustion Chamber Surface Area - A flat top piston and a small combustion chamber will have less heat transfer than a large dome and large combustion chamber. Hot oil - So the oil doesn't overly cool the bottom of the piston and cylinder wall. Of course there's a downside to building all this heat, and that is the probability of adding heat to the air/fuel mixture. Hood Scoop or Cowl - If you're looking for max power, never pull hot under hood air unless forced by rules. Block Exhaust System Heat - We don't want heat from the headers radiating to the intake manifold. Consider header coatings and wraps or maybe just a simple sheet metal baffle to block/deflect the heat. Heat Resistant/Dispersing Intake Manifold - An aluminum manifold with an air gap design is best. Also consider an oil splash pan under the Intake. Ice Down the Intake Manifold - Since it only creates a short term benefit, it's perfect for qualifying laps or drag racing. Strategically placed temperature sensors - Just knowing the temp of the coolant at the front of the manifold is not enough if you're going to push the limits of this concept. More Intake Manifold surface area - The easiest way would be to grind/mill grooves on the outside of the Intake, but you could also add fins. Think air cooled engines. The main point I want you to take away from this article is the advantages of creating a wider gap between upper and lower engine temps. As you go through your day, look around, there are lessons everywhere.